Magnuson Hotels, the world’s largest independent hotel group, announced today the complete rebranding of the Magnuson Hotel – Durant. Formerly a Microtel Inn, this 59-room hotel seeks to upgrade its local, regional and national market position through its affiliation with the Magnuson Hotels brand designation. Corporate, educational, government and leisure travelers will appreciate the 100% non-smoking Magnuson Hotel – Durant located next to Choctaw Casino, Southeastern Oklahoma State University, Lake Texoma, Eisenhower State Park, Red River Railroad Museum and the Johnson Creek Recreation Area. 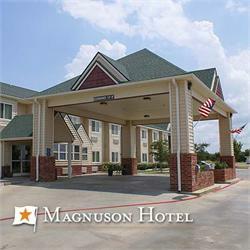 The Magnuson Hotel Durant offers guests free Continental breakfast, free shuttle to Choctaw Casino, The Branch Office Lounge, free high-speed wireless Internet access, guest laundry, free parking with room for large vehicles, and small pets are accepted with additional charges. “Guests will enjoy the variety of activities near the Magnuson Hotel – Durant. We are proud to welcome owner Tim Wigington and his staff, and are committed to increasing their property visibility and reservations,” stated Thomas Magnuson, CEO. As a Magnuson Hotels affiliate, the Magnuson Hotel – Durant will receive complete brand representation across North America and the UK, without the costs and requirements of franchise brand affiliation. In only eight years, Magnuson Hotels has become the world’s largest independent hotel group, representing nearly 2,000 UK and North American hotels with assets in excess of $5.5 Billion. One of the top 8 global hotel chains, Magnuson Hotels is the #1 Hotel Company of Inc. Magazine’s 5,000 fastest growing private U.S. companies.